The manufacturing world is complex place, but that doesn’t mean it needs to be disconnected. Manually tracking manufacturing process is no longer effective for tracking your manufacturing processes if you want to make intelligent decisions about production. Enterprise technology has improved greatly since the early IBM business systems of the 1960s. One thing that hasn’t changed is the importance of an accurate bill of materials (BOM); it remains of critical importance to manufacturers. Equally important is ensuring that your business has the technology in place to automate them. Also known as a product structures, a BOM is a list of the raw materials, sub-assemblies, intermediate assemblies, sub-components, and the associated quantities of each needed to manufacture an end product. As represented in the figure below, the lowest level of BOM includes the components and raw materials that a business would purchase. The next level includes sub-assemblies, or additional components purchased by the company, and then the final level is the finished assembly of the final product, in this example a bicycle. Depending on your industry you might also refer to these components as ingredients for a recipe – fundamentally it’s the same thing. Parent Item - The item that will be created from the BOM report. Component or Assembly - The part number or description of the item on the BOM. Quantity - The quantity of the components required to build the parent item. 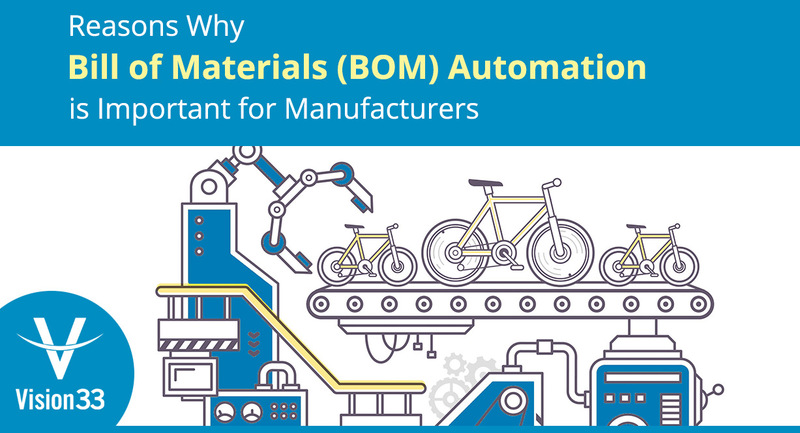 The more complex a business’ product and associated manufacturing processes, the more information you might see on a BOM. Here’s some other information that is useful to include on a BOM. Scrap Factor/yields - The amount of the component item lost during the manufacturing process, waste essentially. 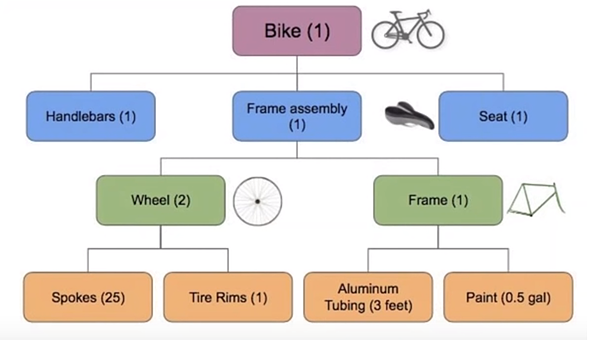 This is important for planning the components you’ll need when you know that as part of the assembly process you need to account for the amount that is unusable or wasted as a result of the assembly process. The scrap factor might also correlate with the manufacturing process or machine used to produce the sub-assembly. Especially for manufacturers that are involved in longer manufacturing cycles you can tie the steps in the manufacturing process where they are required. This is critical for production scheduling because it allows you to tie materials to routing steps. For manufactured sub-assemblies, it determines whether the sub-assembly is built independently or together with the parent assembly. A manufacturer might assemble some of the sub-assemblies required to produce a product and store them in their inventories for future use. However, some components only exist as sub-assembly with the purpose of building the product and are only created in the process of the assembly – you would never see the sub-assembly in inventory. Items which are produced as a result of the manufacturing that are not the parent assembly. These are not necessary scrap but are new items or co-products created as a result of the manufacturing components. This has an impact in knowing your stock levels as a result of the manufacturing process. The problem with IBM’s computer system for managing BOMs, and then later Spreadsheets, was that these systems were still bound by manual processes in sharing data from one system to the next. This meant that the systems that contained the inventory data were not automatically linked to those that produced the BOMs. The resultant data silos cause a disconnected system that leads to miscommunication, inaccurate materials requirements, and ultimately production bottlenecks. These gaps can cause challenges for businesses, however integrated business management solutions offer manufacturers a solution. For more information on how changes in enterprise technology has come to overcome the challenges facing manufacturers using manually integrated BOMs with other areas within their business. Watch the BOM video Why Does Accuracy on a BOM Matter?